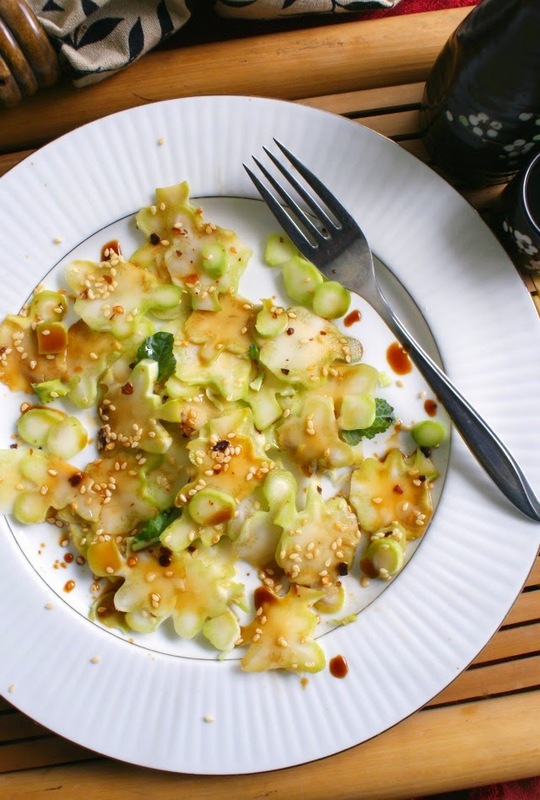 Asian Broccoli Stalk Salad is a crunchy and fresh salad that features thinly sliced raw broccoli stems topped with soy sauce, sesame oil, toasted sesame seeds and crushed red pepper. Okay, guys. I know that this recipe might sound a little strange to some of you. Bear with me here because this recipe will change the way you look at broccoli forever. Yes, this salad is made with just broccoli stalks. Mild, crunchy, fresh, delicious broccoli stalks. You know, the part you usually throw away. So many people throw them away (including me), but did you know that broccoli stalks are 100% edible and hold just as much nutrition as the crowns? Because I did not know that until I saw it in a magazine. I mean, I guess I should have assumed they were tasty, because I've seen hunks of stems in soups before. I suppose I thought they had to be cooked to be yummy. I was so wrong. The stems have a milder broccoli flavor than florets and are fresh and very light tasting. If you're a broccoli fan, never throw away the stalk again. You're going to love this salad! Using a sharp knife or mandolin, cut the broccoli stalks into thin slices. Season with soy sauce, sesame oil, sesame seeds, and crushed red pepper, to taste. One stalk makes 2 servings as a side dish or 1 small lunch salad. Broccoli leaves are edible, too! Remove them from the stalk before peeling and garnish the salad with them like pictured above.